With offices in Louisville and Lexington, Kentucky, Arrow Electric is committed to being a leader in the electrical industry. Our aim is pure and simple – provide high-quality service and workmanship that’s trustworthy, dependable and cost-effective. We embrace expanding technologies and maintain a highly-trained workforce to keep us at the forefront of our industry. 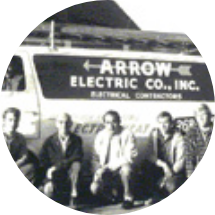 Arrow Electric opened its doors in 1957 with a singular vision – provide our customers with the highest quality electrical installations in the industry. While the times and technologies have certainly changed, our vision remains the same, as does the way we do business: we listen to our customers, recognize and acknowledge their needs, and use our expertise to safely complete the project, on budget and on schedule.